The resort rentals hug the edge of a championship golf course - the Kapalua Bay Course. 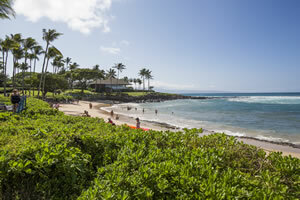 Snorkeling at the famed Napili and Kapalua Bay is a short stroll from your rental. Access to gourmet dining and posh shopping are only five minutes away in ritzy Kapalua. Tucked in a tropical grove, the pool feels like it's in your own backyard. You can walk to Maui's two best golf courses at Kapalua Golf Club. Located in Napili, The Gardens at West Maui are tucked away in a quaint neighborhood with a tropical country vibe. Wake up in your rental every morning to sunrises over a championship golf course. Kapalua Golf Club’s Bay Course is steps from your residence and its sister course, The Plantation Course, is right next door. Since the area is interspersed with local farms, it’s common to hear chickens and roosters, which gives the resort a nice contrast to the swanky shops and dining in Kapalua down the road. The resort has an outdoor pool, perfect for enjoying a relaxing swim or lounge poolside and throw dive sticks for your little swimmers to retrieve. Take advantage of the bbq grills for a family cookout or, dine at a neighborhood restaurant, from the farm-to-table Merriman’s to the mom-and-pop haven of The Gazebo. And if it’s the ocean you crave, you’re a quick walk to world-class snorkeling at Kapalua Bay, as well as the crescent-shaped Napili Bay. Studio and one-bedroom condos sleep four guests and are air-conditioned. Take a family field trip to the Napili Market or the Honolua Convenience Store; your full kitchen won’t stock itself. Back at the resort, whip up a batch of brownies and let the kids assist. Don’t worry if they end up covered in eggs and chocolate; there’s an in-suite washer/dryer. Flat screen TVs have cable and DVD players. Bring favorite movies from home for family movie night. Pop some popcorn, grab the brownies (if there any left) and take a vote to decide what to watch first. Once the little ones have drifted off to dreamland, enjoy a relaxing soak in your jetted tub; wine optional, but definitely recommended. Kapalua Golf Club’s Plantation Course was named the best course in Hawaii by Golf Week for ten years in a row. It was designed by Ben Crenshaw and Bill Coore and is home to the PGA Tour’s Tournament of Champions. The Bay Course hosted over twenty professional golf tournaments and is well-known for their fifth hole; it’s the only hole that plays over the ocean in Maui. Thrill seekers will have a blast zip lining at Kapalua Zipline, Maui’s largest all dual zipline course that features four zipline tours. If you’re in need of a little retail therapy, Whalers Village is the place to go. Get a new pair of shades at Sunglass Hut, or a new swimsuit at PacSun. Browse the selection of activewear at Lululemon. Pandora and Alex and Ani offer jewelry. Get a new handbag at Kate Spade. Need a mid-afternoon pick-me-up? Stop by Island Vintage Coffee. Hungry? Try Leilani’s on the Beach or Joey’s Kitchen.